Chelsea FC hosted the Show Racism the Red Card and Kick It Out School Competition Awards Ceremony 2013 on Thursday 18th April. Young people of all ages and abilities, from schools throughout England produced artwork, creative writing, film and music pieces with an anti-racism theme having worked with educational resources in class. A full list of winners is available here. In total 53 young people from 23 different schools received prizes in 8 categories from presenters including guest of honour, Rachel Yankey. On arrival prize winners and their families were able to enjoy a tour of the Stamford Bridge stadium before the main event. 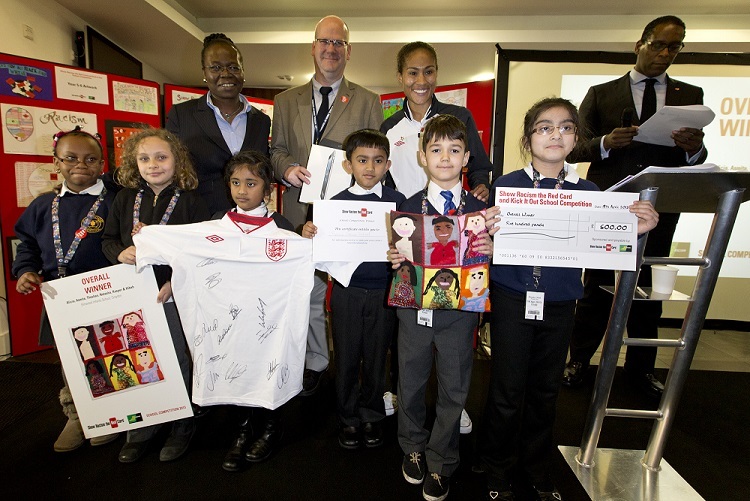 Prizes included a football shirt of each winner’s choice, England shirts, certificates and prizes donated by football clubs and other organisations. Presenters of the prizes included Funke Awoderu – Equality Manager, The FA, Brendon Batson, Luther Blissett, Paul Canoville, John Hegerty – Principal Officer, Continuing PDC, NUT, Tony Higgins – FIF-Pro, Ken Monkou, Paul Mortimer, Osei Sankofa, Richard Shaw, Anwar Uddin, Heather Wakefield – National Secretary for Local Government, UNISON and Roisin Wood – Director, Kick It Out. Also announced on the day were the Overall Winners of the competition, who were Alicia, Asmita, Theshan, Natasha, Kasper and Hibah from Elmwood’s Infant School. Their entry; which was a cushion that reflected the diversity within their school, also won the Year 1-4 Artwork and Creative Writing Category. The overall winners received an i-pad for their school courtesy of the National Union of Teachers, a signed England shirt and match tickets for the group to see England v Republic of Ireland at Wembley and a cheque for £500 for the school.